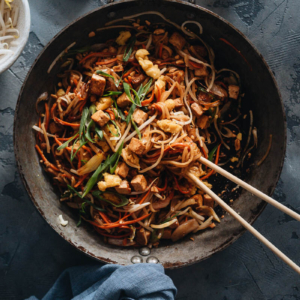 I used to cook with a heavy cast iron wok back in China. 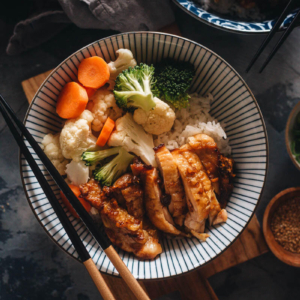 After moving to the US, I needed to change my cooking habits, because our electric stove doesn’t generate enough heat for my flat-bottomed wok. I’ve been cooking with a heavy nonstick skillet most of the time and I love it. However, it does not give the food the beautiful char the way a cast iron wok does. Sometimes the flavor dimensions of a stir-fry fall flat, so I end up using a lot of sauce just to make the dish taste right. Then, I discovered the Lodge Cast-Iron 5-Quart Dutch Oven. I got hooked immediately and started to cook everything with it. Unlike the enameled dutch oven that I previously used, the new one reminds me of the goodness of wok cooking. It heats up within a few minutes, even on an electric stove. It holds heat even as I continuously add things into it, and I can hear the vibrant sizzling throughout cooking. It browns the food in half the time of the enameled dutch oven. Needless to say, I’ve been cooking all my stews in this cast iron pot. Sometimes I even use it to stir-fry food. Right before writing this post, I placed an order to get a Lodge 12-inch skillet just for stir-frying. If you properly wash and store a cast iron pan, it will last forever. Even if you mess it up or let it rust, you can easily bring it back to life. Season a new cast iron pan, even if the pan comes pre-seasoned. It improves the seasoning of the pan so it becomes nonstick really quickly. After seasoning your new cast iron pan the first time, you should rub a thin layer of oil onto the surface before storing. After several uses, a natural patina will develop, so you can skip this step and store it directly. Never wash a cast iron pan with soap or put it in the dishwasher. 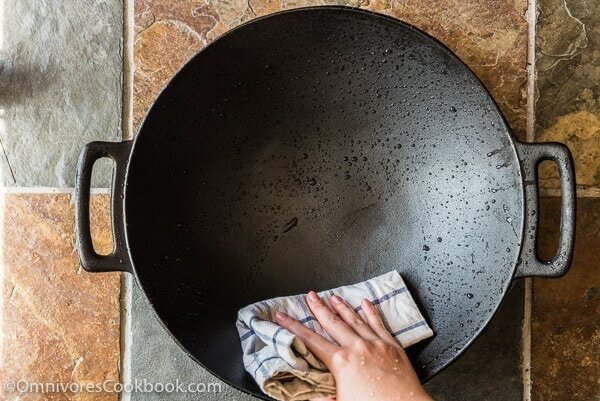 To clean a cast iron pan, rinse it briefly with hot water right after cooking, and use a plastic or nylon brush to scrub the surface until clean. Do not worry if you hear a loud sizzling when the water hits the hot pan. While this sound means you’re destroying a nonstick pan, your cast iron pan will be just fine. Never soak a cast iron pan in water. It will rust very quickly. If you find the pan difficult to clean (usually after you’ve burnt your food or forgotten to clean the pan while it was still hot), watch the short video below to learn how to do it. Always dry all surfaces of the cast iron pan with a clean dish towel after cleaning, to prevent rusting. If your cast iron pan is partially rusted, use sandpaper to remove the rust, and re-season it (according to the instructions below). Rinse and rub it with oil. Repeat the whole process if necessary. Educate your family members on cast iron pan care, to prevent trouble in the future. If you suspect your cast iron pan might be completely ruined, it isn’t. Watch this video to learn how to restore it. Next, I’ll show you how to season a cast iron pan using my newly purchased Mr. Bar-B-Q Cast-Iron Wok. 1. Preheat oven to 170 degrees C (350 F). 2. 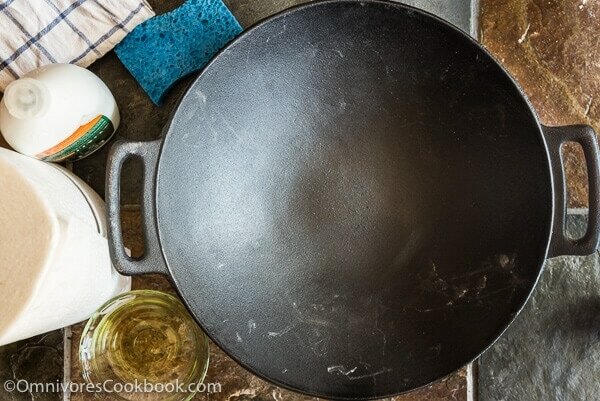 Wash the cast iron cookware with hot water and detergent. Scrub with a sponge to remove the protective coating. You can use detergent to clean the wok prior to seasoning. But if you’re seasoning a pre-seasoned pan, just use hot water to rinse it. 3. Rinse and dry it thoroughly with a kitchen towel. 4. Pour 2 to 3 tablespoons of vegetable oil into a small bowl. 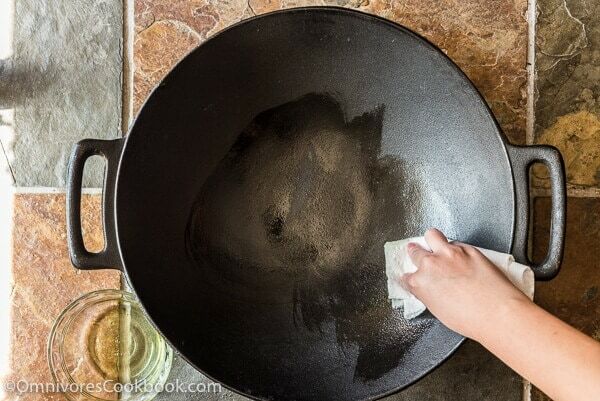 Dip a piece of paper towel into the oil and rub a very thin layer of it onto the surface of the cast iron cookware. Do not use too much oil. 5. 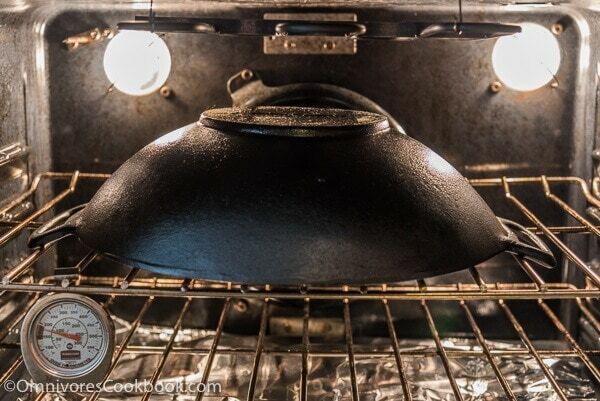 Line a baking sheet with aluminum foil and place it on the bottom rack of the oven (to catch dripping oil). 6. Place the cast iron pan on the middle rack, upside down. 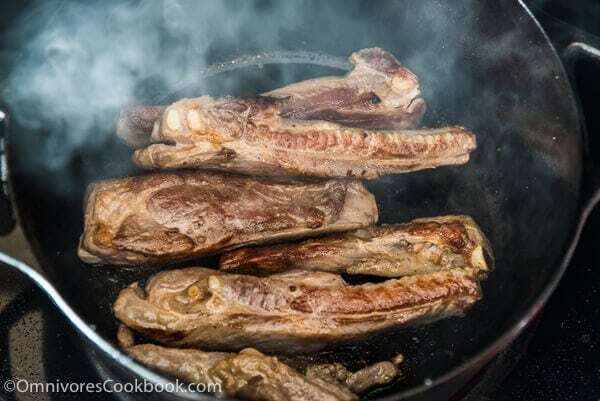 This way, the oil won’t accumulate in the bottom of the pan or prevent any part from seasoning. Open your windows and turn on some ventilation. It’s gonna smell. Let it bake for 1 hour. 7. Allow the pan to cool completely. Use oven mitts (just in case) to remove the pan from the oven. 8. Wipe off any excess oil with a clean paper towel. Now the surface of the pan should be shiny, smooth, and non-stick. The surface shouldn’t feel sticky (usually caused by rubbing on too much oil). 1. 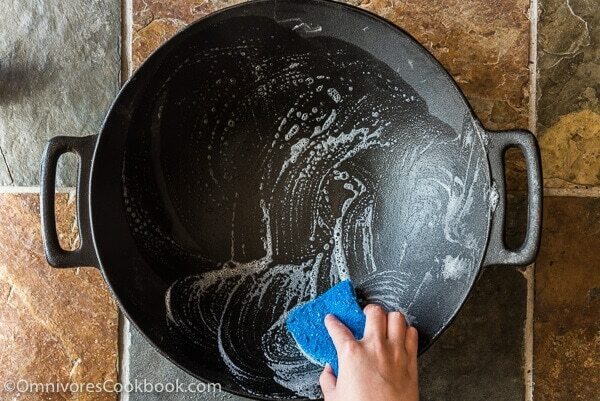 After cooking with the cast iron pan, always rinse it with hot water and scrub it with a plastic or nylon brush. The pan will be very easy to clean if you wash it while it’s hot, right after cooking. Do not use detergent or soap or wash the pan in a dishwasher. It will remove the seasoning. If food sticks to the pan and won’t come off, do not soak the pan in water. Watch the video in the post to learn how to clean the pan if food sticks to it. 2. Apply a thin coat of oil prior to storing. 3. After using a cast iron pan repeatedly, a natural patina will develop and you won’t need to rub oil onto it prior to storing. 4. Store the pan in a dry place. 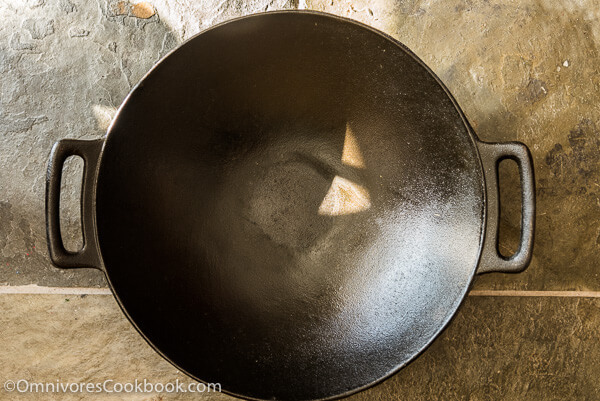 i do clean my cast iron with sea salt and little water…and always season it with oil. it has worked so far. cast iron is probably my fav kitchen tool. Great post here Maggie. I haven’t had to re-season my cast iron skillet in quite a while after doing it properly like this and it just gets better with time. To sometimes get a bit thats stuck off I use kosher salt to assist with a sponge as to not ruin the natural patina of the seasoning. No soap! Thanks! Thanks Kevin! Sometimes I found the cast iron pan simply get better if you cook with it. Doesn’t really need to re-season it too often. Definitely no soap! I have not seen a flat iron skillet wok here in HK.. Will have to keep my eyes open for one. So it looks like I will need to switch over to a flat bottom wok if not in Asia, right? Great little how to Maggie! Should I do the same for my new le creuset Dutch oven or there’s a different way to it? Thanks! Hi Tammie, if I remembered right, all the La Creuset dutch ovens have enameled interior which does not require seasoning. 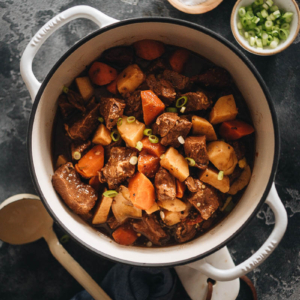 You need to follow the instructions that come with the dutch oven. 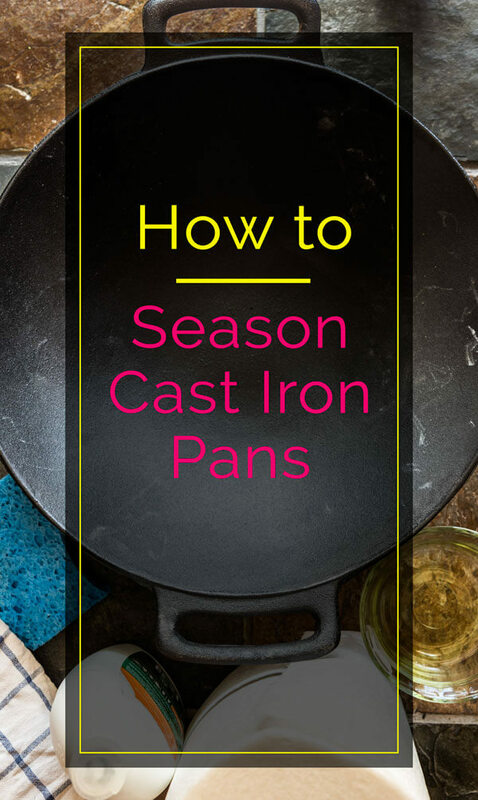 The method listed in this post only applies to cast iron pans that do not have any coating. I have just this night found your site. I am so excited to start cooking again. I became burnt out with the old stand by chicken dinners. I am trying to cook healthier, and the recipes that I have been reading are inspiring. As I am reading, I am also looking on Amazon for the proper cooking equipment. Lucky for me I redid my kitchen appliances about a year and a half ago, and I up-graded my stove. It actually has a burner on it that can produce high heat for wok cooking. I have never tried tofu before, but the meal looks awesome. I am really excited to try new cooking. 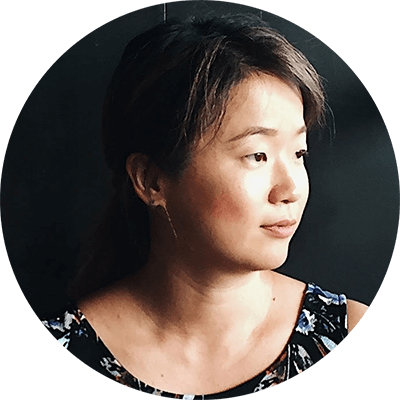 There is a store here called H-Mart, and I believe that I can find authentic bean sauce, fermented black beans, and fermented spicy bean paste. If not there then at the Dekalb Farmers Market. This market has everything. I specializes in food from other areas of the world.